The starting point of the route is Alykes (or Alyki, i.e. salt production facilities), which ceased operating in 1981 but still covers an area of 50 hectares. At its operational peak, Alykes had an annual capacity of 8,000 tons. Already in 1840 it was one of the 6 largest salt production facilities in Greece, while employment here was considered – not without reason – heavy work. For years, the product was loaded onto ships from the pier right in front of the operations, where today remains of an iron structure can be seen emerging from the sea. Alykes consists of flat, shallow basins along the sea coast divided into discrete sections (pans). Seawater circulates through them, which after evaporation leaves deposits of crystallized salt (NaCl). For the successful operation of a salt pond it is necessary that the basin beds be water-impermeable, and for this reason they typically have a clay sealing bottom layer (as is usually the case on Milos) to retain water. Another advantage was the area’s geothermal field as it increased the evaporation rate in these ponds. Even today, that Alykes is not in operation anymore and is the property of the Greek state (Hellenic Saltworks S.A.), in summer the whitish layer of salt remaining after the evaporation of the seawater that has flowed into the pans during the winter months is visible. As you continue on the coastal road in a southwesterly direction, and soon pass the intersection for the airport on your left, you will find a temple-like monument (P1), erected in memory of the 14 Melians executed by the occupying forces during World War II. The entire surrounding area and the monument itself is known as ‘the Fourteen’ taking its name from the number of victims. Right after the monument, leave the main road and turn left uphill on the asphalt road, which after a while becomes a passable dirt road. In fact, you will be driving on a soft bed of perlite which looks like sand. 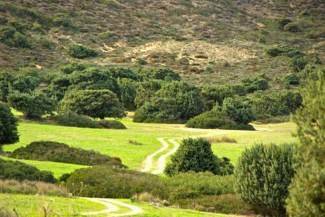 You will drive through farming areas with olive groves and vineyards, and fields where cereal crops are grown. It should be noted that Milos is ideal for these particular crops, because of the volcanic origin of its soil, which favors the aeration of roots and enables the soil to be easily plowed. Moreover, moisture is captured and held in the soil’s lower layers, benefiting summer dry cultivations. Native species that have adapted to this particular, local climate are preferred, being also resistant to weeds and requiring minimal plant protection. As you go up the passable dirt road, you reach the cedar forest. Cedar is one of the three conifers native to Milos. Its scientific name is Juniperus macrocarpa (plum juniper). It likes sandy soils so it is found in sand dunes on beaches and in soils formed on top of perlite and pumice. Cedars, scattered or in clumps – remnants of the large cedar forest that covered these hills before the fire of 1982– pop up in olive groves and small vineyards, natural meadows, brushy areas, and abandoned fields. Continuing south, you leave the cedar forest behind. The hillsides are now covered with low vegetation, with the dominant species being those resistant to grazing, such as mastic (Pistacia lentiscus), genista (Genista acanthoclada), heather (Erica manipuliflora), spiny broom (Calicotome villosa), thyme (Thymus capitatus) and lavender (Lavandula stoechas). Just below, you pass by the chapel of Aghios Athanasios (P2), a modern church built on private land. The hilly area from the monument of “the Fourteen” to the area with the “potholes” (see below) is full of domes and successive rhyolite lava flows ejected from the Firiplaka volcano when it was still covered by the sea. The lava that then erupted from the undersea volcano formed thin layers of small biotite crystals within masses of molten rock which enclosed volumes of seawater. Both the summit and the edges of the crater of the undersea volcano solidified and cracked as the lava was rapidly cooled by the seawater, resulting in the perlite appearing fragmented (‘broken’ lava streams) at the edge of the flow, while inside the flow the perlite was folded inward and appears relatively less disturbed. 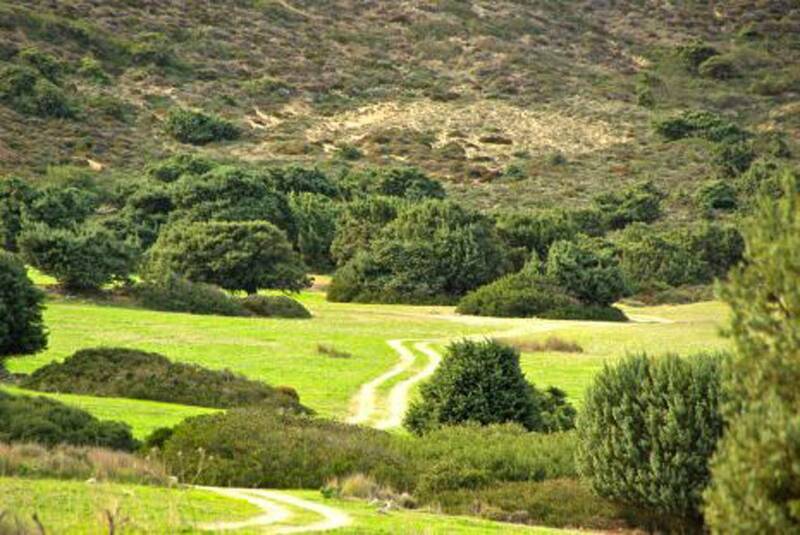 About 700 meters beyond the church of St. Athanasios, at the point where the road turns to the east, you will see in front of you the Kedrolivado (P3), a large meadow with scattered age-old cedars, which you will cross. Many of these trees reach a height of 11 meters, and the diameter of the trunk can reach up to a meter and a half. Descending from the Kedrolivado, you cross the hillsides where you will see many “potholes”, or else artificial pits created by stock breeders to retain rain water, necessary for sheep and goats to quench their thirst, and an old stone building which was probably once used to store graded perlite. 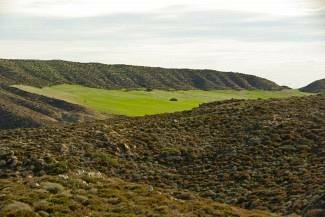 At (P4), you can enjoy beautiful views towards Zephyria. In ancient times Zephyria was one of the names by which the island was known. In his Natural History Pliny the Elder says that Aristotle called Milos by that name (which is etymologically connected with Zephyrus, the West Wind), as it belonged to the western Cyclades. Zephyria was the capital of the island, and was named “Milos” or “Chora”, from the middle of Venetian through the end of Ottoman rule, and in 1901, by decision of the City Council, the island took its current name. In 1207 the Venetians occupied the island and settled in the Castle (Plaka), which offered them greater protection from raids. Half a century later (1350-75 AD), they built a tower in the area of the current Zephyria to monitor the harvest and the collection of taxes. A small settlement soon grew around the tower, which was fortified with walls and a moat, and gradually spread beyond the walls. The settlement enjoyed significant economic development, and soon the Frankish rulers and the Venetian bishop transferred their seats there, proclaiming it the island’s capital, with “Protothalassa”, the current Kanava, as its port. The Church of the Assumption or of Panaghia Portiani in Zephyria was the cathedral of the island, and popular assemblies were held in its courtyard. There followed four centuries of prosperity until Zephyria began to decline, mainly due to the “morbidity” of the climate. 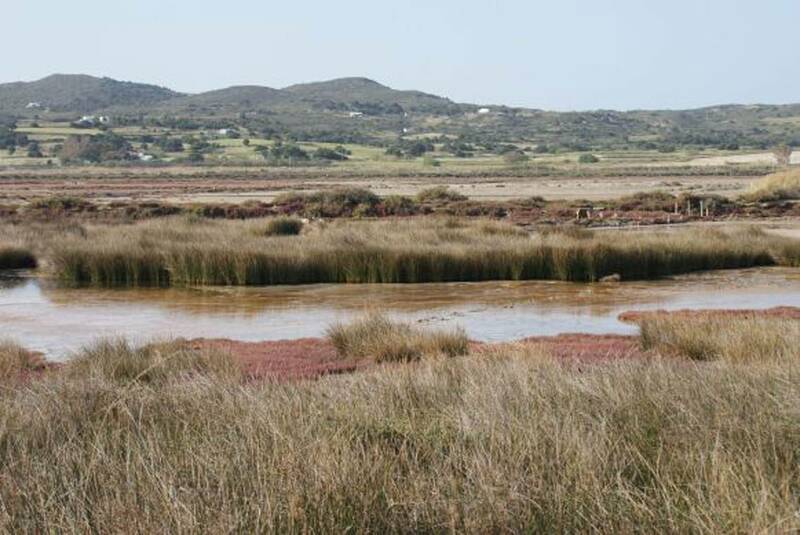 The mysterious “disease of Milos”, as foreigners called this “morbidity”, was perhaps related to malaria (due to the then marshy land adjacent to the current salt ponds). This fact, in conjunction with local earthquakes that occurred during that period, contributed to the abandonment of Chora, culminating in 1767, the year of the “Great Dying.” However, Chora was never completely uninhabited and later, with steps taken to combat malaria and with mining operations running nearby (mainly sulphur but also kaolin mines), its population stabilized and gradually returned. Plaka had now become the capital, however, with Adamas as its port, having already been colonized by Cretans (Sfakians). Arriving at the intersection at point (P5), continue south and cross through the most striking part of this route. The huge part of land sunken in front of you is the Fyriplaka crater, with a diameter of 1,700 meters and a depth of 200 meters. It is a pyroclastic cone the same age as the Trachylas crater on the north side of the island, namely the Middle-Upper Pleistocene (480,000-90,000 years ago). 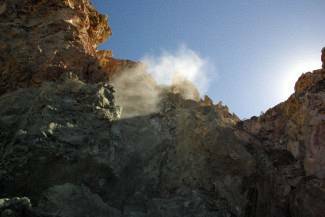 You may notice layers of ash, sand and rhyolitic perlite fragments in continuous alternations. Around the Fyriplaka crater (as well as that of Trachylas) are deposits of perlite. Perlite is a mineral (natural volcanic glass) with the same chemical composition as obsidian and pumice. In its granular form, perlite has the property of expanding in volume up to 20 times when sharply heated at 900-1000 ° C, and becoming particularly light (nature once did essentially the same thing when it created pumice). Perlite is used as a lightweight aggregate for construction products and insulation, as a soil conditioner, as a filter aid for liquids (juices, beer, edible oil), in industrial insulation and for other special uses. Milos is the largest center for the mining and processing of perlite in the world. In this area you are crossing, the vegetation varies again. Ahead of you lies a large artificial meadow up to the edge of the volcano, where the agricultural machinery could not have access. On your right large cedars suddenly appear, remnants of a great forest that has slowly disappeared over the years. A typical plant of the region is thatching grass (Hyparrhenia hirta), a perennial graminaceous plant that has become abundant here due to its resistance to grazing by sheep and goats. In sections of the road you can see layers of pyroclastic deposits, mainly sands, which are indicators of submarine sedimentation, as in some of its active periods the volcano was below sea level. It was from this volcano that the large flows, that formed subsea perlite, came. You will also notice rows of layered pyroclastic materials (naturally fractured materials of volcanic origin) inclined toward the inside of the crater, and continuously alternating layers of ash, sand and perlite fragments. In some of them there is evidence of undersea deposition (e.g. more sizable perlite fragments are “immersed” in the underlying deposits), while other layers, especially unclassified and coarser perlite material, are probably products of terrestrial deposition. We see, then, that during relatively recent geological time the environment for depositions changed from a coastal to an inland one due to the tectonic movements associated with volcanism. Arriving at the southernmost point of this route (P6) at Kalamos, you will see the old kaolin mining galleries. Kaolin outcrops are visible on the outskirts of the Firiplaka volcanic cone, where preexisting volcanic rocks have undergone intense alteration by acidic solutions generated from escaped hot vapors rich in hydrogen sulfide. At these vents (fumaroles), the clear, well-formed yellow crystals are deposits of native sulfur formed by the oxidation of hydrogen sulphide in the atmosphere. The sulfur is accompanied by a series of relatively rare secondary sulphate minerals such as melanterite, halotrichite, and alunite, which develop in clusters and are derived from the chemical alteration of the components of perlite and other volcanic rocks in the area. Alunite (also known as alum) has been used as a hemostatic in medicine from ancient times. Alums and alunogens have also been recorded in the same area. Sulphate minerals are hydrous minerals and appear pink, white, yellowish and light green in color. They are extremely fragile and are perceived as tiny needles, thin encrustations, and compact aggregates. The fumaroles, release points of hydrosulfide gas with its characteristically pungent odor and a temperature reaching 1000 º C, are most visible when the ambient temperature is low and the condensation higher. In any case, however, the strong odor of hydrogen sulfide will be noticed. Beyond the points of stronger fumarole activity which may be detected over old mine galleries, there are many places with elevated temperature, easily felt. To the southwest, you can observe the continuity of the volcanic cone and the spread of pyroclastic material, such as in the Firiplaka promontory. When the visibility is good, you will have the opportunity to admire Prasonisi and Ananes (Dipses) islets. 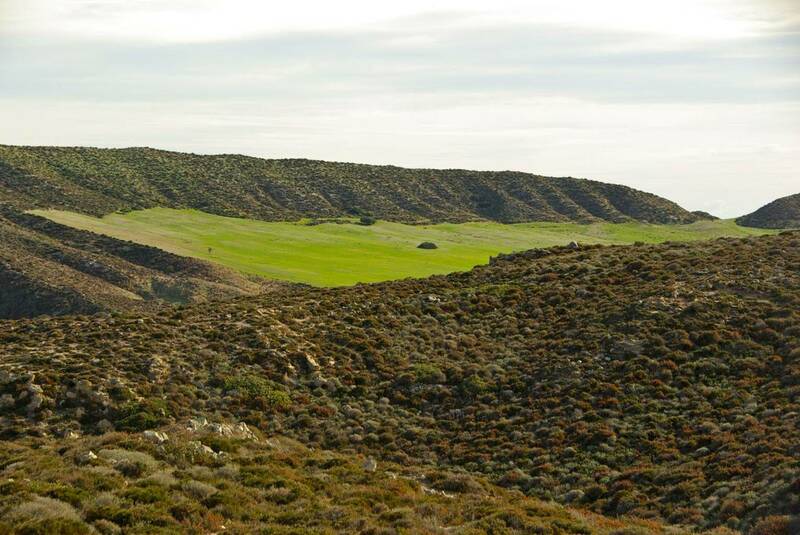 The vegetation in the area of Kalamos is highly degraded owing to the acidity of the soil and intensive grazing. Some types of low-growing bright green plants have managed to survive in the highly acidic environment. 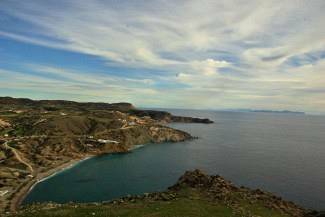 From the area of the fumaroles, and even better from the top of the hill a little further south, where the Telecommunications Company OTE antennas are, you can enjoy a panoramic view of the south coast of the island. The beautiful beach you see just east of Cape Kalamos is the beach of Aghia Kyriaki, one of the most touristic of the island. Archaeological investigations such as those carried out by the University of Glasgow with the financial support of S&B Industrial Minerals S.A. (S&B), conducted over the years, have shown that the region of Aghia Kyriaki was a settlement in antiquity and that there was also exploitation and processing of industrial minerals already going on in the late Hellenistic and Roman periods. For the rest of the route take the same road in reverse to the point of the intersection (P5), where you continue straight (north), descending on a passable dirt road through the ravine. At one point (P7) you will reach the area “Stoloi”, where you can see the old buildings from wells excavated by the Municipality of Milos to meet the island’s water needs. Since the early 2000’s these have been abandoned, as the island’s water now comes mainly from desalination. Continuing on to the north, you see hills on the right and left, sparse clusters of cedar, agricultural land with olive groves, fields planted with grain and summer vegetables. In this region, which is known as the Kampos, there are also greenhouses that supply Milos with fresh vegetables, which are especially tasty due to the volcanic soil. Before you come out on the main asphalt road, you will pass by two interesting churches. One of them, Aghios Dimitrios (P8) is a small church with no frescoes, among the many which were previously located in the Kampos, built on private land behind (south of) Aliki. The oldest document referring to St. Demetrios dates to 1840, so we know that the construction goes back to an earlier period. Due to the buildup of alluvial deposits in the area, the floor of St. Demetrios is about half a meter below ground surface. Aghios Georgios “the Katzilieris” (P9) is another church in Kampos, also located on private land. The construction dates prior to 1730, according to the oldest document which refers to the church. This church has no frescoes either. After Kampos, the road turns to the east and bypasses the Milos airport. The airport was constructed in 1972, with the financial and technical assistance of S&B (then Silver & Baryte Ores Mining Co. S.A.) right next to Alykes. Past the airport, the road continues right, along the northeastern edge of Alykes, which is covered with herbaceous vegetation with bold red/brown colors. Alykes today is an important wetland with halophytic vegetation, i.e. plants that require high salt concentrations for growth. One such plant is samphire (Salicornia europaea), which in summer takes on a characteristic red color. Every spring and autumn, the region is a resting and “refuelling” station for many species of migratory wading birds and birds of prey. A little before returning to the main asphalt road –where the route will be complete– at the base of a low mound on your right, you come upon the source of Alykes, a cave with thermal mineral water (P11) with a temperature of 29ºC and a chlorine content that indicates a mix of fresh to sea water in a ratio of 2 to 1 [measurements of 1985 – M. Stamatakis]. In a text from 1835 (Xavier Landerer, “On the Hot Springs of Milos”, 1835) it is stated that the spring is “at the foot of the small hill coming from the old city (Zephyria) at the port where the salt marsh is today…”. The same source states that the entrance was low, so someone needed to crouch down to get into the cave, one that could accommodate 60 to 70 people and where the water temperature reached 25°C. Today the cave cannot be visited, because the roof has fallen in near the entrance.